Tathra Homestead produces varietal extra virgin olive oil (EVOO). EVOO is the natural oil (freshly squeezed) from quality olives that have been picked straight off the tree and processed as soon as possible without the use of any chemical, or excessive heat, which ensures that the oil’s remarkable health benefits, flavour and freshness are maximised. Australian EVOOs are renowned for their unique very low level of saturated palmitic acid and high level of mono-unsaturated oleic acid which are highly regarded for its health benefits. In addition to containing natural antioxidants, EVOO has a distinctive olive fruit aroma and flavour which creates a tasty experience for a wide variety of dishes. Tathra Homestead is a signatory to the Australian Olive Association Code of Practice called Olivecare. Olivecare aims to guarantee the authenticity and quality of certified products and distinguish them from imported products. To be certified, products must be Australian and have undergone organoleptic (taste) and chemical testing. 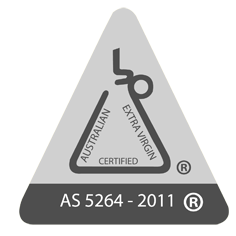 Look for this symbol when buying your oils - that way you know it is certified Australian Extra Virgin. Olive oil can be used for dipping with bread, marinating, salad dressing, frying, cooking or anything else (even massage) for which you would normally use oil. Manzanillo The olives produced are round, hence in Spanish the variety's name means ‘little apple’. The olives mature early in the season and are the first variety we pick at Tathra Homestead. Mission The olives produced are medium sized and shaped similar to almonds. They are also slower to mature, so are our latest picked variety. The trees are super at growing tall, keeping us on our toes when pruning time comes! Correggiola The olives might be small but deliciously full of oil. We pick this variety either at the same time as the Manzanillo or shortly after. Early picked The fruit is picked at the beginning of the season whilst most of the fruit is still green. Smells and tastes similar to fresh green grass. Late picked The fruit is picked later in the season whilst most of the fruit has ripened and is black. Has more of a buttery smell and taste.